In terms of mobile phone history, 2002 was a very long time ago.. and you would expect a handset from that era to be obsolete and completely unloved, right? Well.. almost. There's an exception to every rule.. and that exception is the Nokia 6310i. 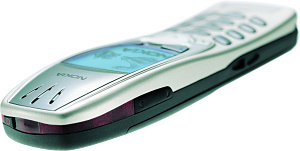 The 6310i itself was just a slightly upgraded version of the 6310 (from 2001) which in itself was an upgrade of the 6210 (from 2000). So, the 6310i is a six year old phone based on even older technology, which makes it remarkable that you still see the 6310i in use today. By modern standards, the feature set seems pretty laughable. The display is a 96 x 60 pixel monochrome panel, and the 6310i doesn't have a camera, music player or even polyphonic ringtones. But it was one of the first Nokia handsets to support Bluetooth, and it came with GPRS data and Java support for downloadable applications. But there are several features in the 6310i that Nokia have never really been able to match. Firstly, it is a very easy handset to use. The number keys are well spaced and very comfortable to use, and the menu and selection keys are exceptionally simple and intuitive. Add to that the large call and hang up keys, and many people would argue that the ergonomics on the 6310i have never been bettered. It's quite a tall phone, coming in at 129 x 47 x 17mm, but combined with an ergonomic design, it means that the microphone is somewhere in the vicinity of the mouth when in use, which is handy. The large size also means that the 6310i is quite robust - most surviving ones will have suffered a few bad drops in their time. The battery life was excellent too, with a maximum talktime of over 7 hours and up to 17 days standby time, the 6310i easily outlasts many of its modern competitors. The Nokia 6310i is still popular today, and refurbished handsets can cost up to £100 / €140 or so. New ones are very rare as the phone has been out of production for some years, and prices range from around £150 to £220 (€200 to €300). Why so expensive? Simply because many people see the 6310i as the best handset that Nokia have ever made in terms of usability.. and they'd like to stick with it. Whether you think that the 6310i is an old clunker or a design classic is up to you. But we certainly think that Nokia could still learn a thing or two from this ancient mobile phone.